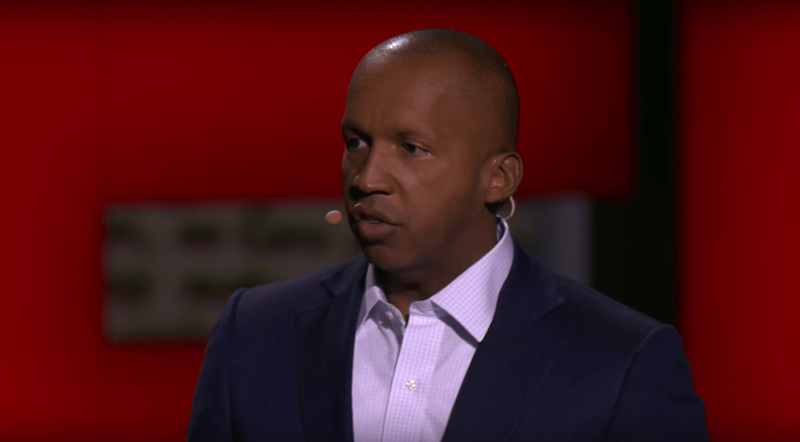 The founder and Executive Director of the Equal Justice Initiative, Bryan Stevenson, during his 2012 TEDTalk. Who will speak for Alabama’s ghosts? This story was orginally published on May 24, 2016. We are reposting to mark the opening of the National Memorial for Peace and Justice in Montgomery, Alabama. Find our review of the memorial, which opened in late April, here. “Everyone’s story matters,” said Bryan Stevenson to the crowd gathered at the Equal Justice Initiative on a sleepy Saturday morning in early May. Before the doors opened, staff at EJI wondered whether anyone would show up. But more than a hundred people traveled from across the United States and from across Alabama to respond to EJI’s invitation to participate in memorializing a part of our country’s history that has been left unaddressed: the lynching of African Americans in the years between the end of the Civil War and the end of World War II. The call to value all stories, even painful ones, was an invitation to remember, to honor, and in so doing, to begin to heal. As he spoke, my eyes were drawn to tables along the wall topped with dozens of empty glass jars. Some of the perfectly polished containers were emblazoned with names, others just bore the word “Unknown.” In smaller print on the gallon jars were the names of towns strewn across the state and dates ranging from the 1880s to 1947. Each jar was one life snuffed out in racial terror. Our task was to collect soil from the sites of each lynching. Jars holding dirt from the sites of lynchings. Photo by Christine Folch. Lined along shelves on the back wall behind us were rows of dozens of jars, already filled, and empty rows, waiting to hold our jars, with barely enough room for the 367 African Americans who lost their lives in Alabama alone. This is just the beginning of what will become the Memorial for Peace and Justice, an EJI-sponsored museum marking the lynching deaths of those victims of our nation’s narrative of racial difference. Four thousand souls were killed in 12 southern states alone. Like Germany’s memorials to the Holocaust and South Africa’s truth and reconciliation process, remembering the history of racial violence in our country is a critical step towards liberation. Stevenson has a habit of making bold and compelling invitations. The death row attorney’s 2014 TEDTalk “We need to talk about an injustice” asked a complicated question in a very simple way: What is broken in our country’s justice system and how may we begin to fix it? It’s a problem to which the MacArthur Genius Award winner has dedicated his life as his office has grown from one lawyer to a staff including more than thirty attorneys and legal fellows. Victories at EJI are hard fought, hard won. From its beginning re-litigating death row cases in which the defendants were wrongly accused—one famous case featured recorded conversations of Alabama police pressuring a witness to falsely incriminate Walter McMillan, who was at a church fish fry during the murder he was supposed to have committed—EJI has expanded its focus. One fight has been against political influence in death penalty sentencing. Alabama is one of three states that practice “judicial overrides.” But it is the only one where elected judges may effectively overturn the sentencing recommendations of the jury. When juries return life sentences, judges may instead impose the death penalty. And they do. Judicial overrides regularly go up just before re-election campaigns. Almost 20 percent of inmates today on Alabama’s death row were placed there because of judicial overrides. EJI’s team has also focused on punishment of youth. The staff successfully argued a Supreme Court case against life sentences without parole for children sentenced as adults. More than 2,000 inmates across the United States are currently serving “sentences to death in prison,” some were as young as 12 when they were incarcerated. Now the legal team is working on habitual offender laws, where convicts are put away for life for non-violent offenses—for possessing marijuana, for stealing a bike. The walls of EJI are decorated with photographs of electric chairs, of children standing on boxes to have their fingerprints taken, and of clients winning their freedom. Many, though by no means all, of EJI’s clients are men, women, and children of color. Yet, just one block away from the statehouse on that same promenade stands Dexter Avenue Baptist church. In the basement of the red-bricked building, the church’s young pastor Rev. Dr. Martin Luther King, Jr. and others organized the Montgomery Bus Boycott. The cradle of the Confederacy became the heart of the Civil Rights movement. As recently as three years ago, however, the history of slavery in Montgomery was silenced, rendered invisible. The Commerce Avenue building which houses EJI once served as a warehouse owned by the very same John Murphy where enslaved people, newly delivered from the Alabama river, awaited sale at the market a few hundred feet away. In 2013, the Alabama Historical Commission’s Black Historical Council installed a plaque in front of the building to explain the role of slave depots in the slave trade. To help mark the history of lynching in the United States, a friend and I drove with three empty jars to the quiet township of Kennedy in Lamar County, on the Alabama border with Mississippi. Kennedy is beautiful, with rolling tree-covered hills, small creeks that work their way through the low country, and rich, loamy soil teeming with life. There, in the spring of 1897, the Ku Klux Klan embarked on a brutal campaign of terrorizing the local African American community. The night of May 30, 1897 a KKK-led mob went after James Denton, a black man they intended to lynch for allegedly breaking a labor contract with a white farmer. But when the KKK group descended on Ike Bonner’s house, hoping to capture Denton, he was nowhere to be found. The crowd instead took hold of Bonner’s friend John Hayden, shot him, and lynched him. His only crime was being at his friend’s home. Federal prosecutors, in a rare move of determination, decided to reign in the KKK activities because local authorities would not. Two courageous Kennedy men, John and Louis Bonner—relatives of Ike—took the witness stand in the federal case. In spite of threats against their lives, the Bonners’ testimonies led to the convictions of several Klansmen. But as soon as they returned to Kennedy, government promises of protection notwithstanding, a mob of furious KKK members fell upon the Bonners and riddled their bodies with bullets on December 16, 1897, before setting fire to the cabin where they lived. Knowing what it might cost them, the Bonner’s had stood against a maelstrom of racial terror and lost their lives to it. No one involved in the deaths of John and Louis Bonner faced justice. Though we did not know the precise location of their killings, we found an embankment of soil on one of Kennedy’s main roads and there filled the jars with Hayden’s and the Bonner brothers’ names. The three now stand on EJI’s shelves in Montgomery, attesting to a history of violence that has been silenced. And when the EJI Memorial for Peace and Justice is built, some of the soil will be used to make a concrete marker, reminding visitors of what was lost as a result of our history of racial inequality and the ideology of racial difference that bolstered it and, in this way, finally begin to change the narrative. Healthcare providers have a plan to solve the maternal and infant crisis in Alabama. It’s an approach that could work everywhere: a return to midwifery care.